Roy Curtiss III, Ph.D., a professor at the UF College of Veterinary Medicine, has made a huge impact on infectious disease research in his 84-year lifetime, and he has no intention of stopping anytime soon. Hired through the UF preeminence initiative in 2015, Curtiss is a professor in the college’s department of infectious diseases and immunology and a member of the prestigious National Academy of Sciences. Elected as a fellow in the National Academy of Inventors in 2016, Curtiss is internationally known for his intersectional expertise in multiple fields, including genetics, microbiology, biomedical sciences and vaccinology. His pioneering work in the areas of microbial pathogenesis, genetic manipulation and vaccine development has been used to address worldwide problems in animal, human and environmental health. Also in 2016, the Sid Martin Biotechnology Institute, the leading biotechnology incubator at UF, announced that Curtiss Healthcare, a startup vaccine-technology company Curtiss formed in 2015, had been admitted into its Alachua bio-incubation program. Before joining UF, Curtiss enjoyed a rich career in microbiology and genetics research at Arizona State University, where he worked for 11 years and directed The Biodesign Institute’s centers for Infectious Diseases and Vaccinology and Microbial Genetic Engineering. He previously chaired the department of biology at Washington University in St. Louis, where he served as a faculty member for 22 years. The American Society for Microbiology honored Curtiss with its Lifetime Achievement Award in 2014. This was a highlight for Curtiss, who never took a course in basic microbiology or virology. Among his most notable scientific contributions is the co-discovery of the molecular genetic means by which Salmonella bacteria invades cells of the body. Salmonella is a common bacterial disease that affects the intestinal tract in humans and animals. His influence regarding Salmonella research goes back to the early 1990s, when Curtiss formed a company known as Megan Health to develop animal vaccines, and he eventually left a departmental chair position in academia to work part-time there. In 1998, the company developed a vaccine to prevent Salmonella infection in broilers and laying hens. In 2016, this vaccine was administered to over 3 billion chickens. “Making agriculture more productive while at the same time enhancing food safety for consumers is a major objective in developing vaccines to prevent infectious diseases,” Curtiss says, adding that the company’s technologies improve food quality and safety and help treat and prevent serious infections in animals and humans. You could even say Curtiss’ story started with a chicken. As a 16-year-old in 1950, he won the Chicken of Tomorrow contest at the New York State 4-H competition. 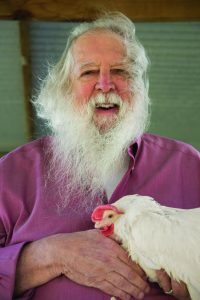 This led to his early work in avian genetics: crossbreeding white Plymouth Rock and white Cornish chickens to yield broilers with better meat structure and production, and better genetics to protect against Salmonella and E. coli infections. His life story reflects his early passions: a fascination with science, a thirst for excellence and a desire to make a difference in the world – something Curtiss is clearly doing every day.